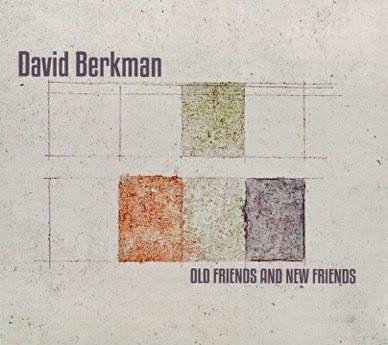 The title of Old and New Friends, the latest release from award-winning pianist/composer David Berkman, refers specifically to the exceptional sextet that he assembled for the recording. The band joins two members of Berkman's recently-formed quartet - saxophonist Dayna Stephens and bassist Linda Oh - with three renowned musicians who can definitely be considered old friends: drummer Brian Blade, who appeared on three of Berkman's albums in the late '90s and early 2000s; and saxophonists Adam Kolker and Billy Drewes, both of whom Berkman has known for more than 30 years. But Old and New Friends also reunites Berkman with a label, producer, and way of working that has come to seem almost old-fashioned as the music business has undergone rapid changes over the course of the last decade. The album will be released May 5, 2015 on Palmetto Records, which issued four of Berkman's CDs between 1998 and 2004. Like those discs, the new album is produced by label founder Matt Balitsaris at Maggie's Farm, his recording studio built in a beautiful 18th century stone barn in bucolic Bucks County, Pennsylvania. "Going back to that place was very evocative and nostalgic," Berkman says. Working with Balitsaris again also helped to shape his vision for the album, adding a helpful filter too often lost in today's independent-minded digital age. "The first thing to go in the internet age was editing. I like having somebody to work with who brings an outside voice and can add their perspective. Matt's approach is dynamic and involved and he had a big hand in shaping the recording." In the eleven years since his last Palmetto release (2004's Start Here, Finish Here), Berkman has released a solo piano record (Self-Portrait) and a pair of live small-group albums recorded at NYC clubs Smalls and Smoke. But Old and New Friends marks the first new studio album of his original music in that time, and it's a captivating showcase for Berkman's eloquent, sophisticated compositions, which deftly weave together six strong but disparate voices into an organic and exhilarating unity. "Everybody on the record has very different personalities," Berkman says, "but they're very clear personalities to me. Dayna Stephens is very adventurous, loose and open-minded; Adam Kolker brings a really refined and sophisticated quality, with beautiful lines and great pitch; and then Billy Drewes is very lyrical, with a sensibility a little like Ornette Coleman or Dewey Redman, great free players from the 60s and 70s." Bandleaders like to say that they write for personalities, not instruments, but Berkman's familiarity with his bandmates is evident throughout Old and New Friends. The three saxophonists all have opportunities to bring their identities to the fore, whether volleying ideas back and forth on "Past Progressive" or weaving soaring soprano lines around one another on "Strange Attractions Then Birds." On his lush arrangement of "West 180th Street," Berkman takes full advantage of the range of woodwinds and voices available to him from the three-horn frontline, while the opening "Tribute" pays homage to frequent collaborator Tom Harrell with its plain-spoken but resonant melodicism. Brian Blade, one of modern jazz's most acclaimed drummers both as a sideman for greats like Wayne Shorter, Bill Frisell and Joshua Redman, and as leader of his own Fellowship Band, appeared on three of Berkman's four earlier Palmetto CDs (Handmade , Communication Theory , and Leaving Home ). "The second I hear a recording I can tell that it's Brian," Berkman says. "His use of dynamics is really unique and very personal." Those dynamics are on vivid display on tunes like "No Blues No Really No Blues," a puckish not-quite-blues rejoinder to Miles Davis' "No Blues" - which, as Berkman points out, is paradoxically very bluesy - and "Psalm," a piece of simple beauty which Blade illuminates with delicate, shimmering colors, like rays of light through stained glass. He also contributes a jaunty, precise swing to "Up Jump Ming," a sly, fiery nod to Freddie Hubbard. Both Stephens and Oh are rapidly rising stars, and have been part of Berkman's working quartet for the last several years along with drummer Johnathan Blake. Stephens has worked with names like Kenny Barron, Ambrose Akinmusire, Eric Harland, and Brad Mehldau, while Oh has recorded and toured with the likes of Dave Douglas, Joe Lovano, and Steve Wilson. Oh's articulate playing is spotlighted in the chorale-like first half of "Past Progressive" and anchoring "Deep High Wide Sky," written on the chord changes of Irving Berlin's "How Deep is the Ocean." Berkman himself has been an integral part of the jazz community since moving to New York in 1985. He was awarded the 2000 Doris Duke/Chamber Music America New Works Creation and Presentation Grant and his recordings have appeared on numerous year-end critic's lists, including the New York Times, Village Voice, Downbeat, Jazziz, JazzTimes and others. He's played in countless bands including those of Cecil McBee, Tom Harrell and the Vanguard Orchestra, and co-leads the New York Standards Quartet with Tim Armacost, Daiki Yasukagawa and Gene Jackson. Berkman is also a teacher and clinician who has performed and taught at numerous jazz camps, universities and conservatories around the United States, South America, Asia and Europe. He has published three books with Sher Music Publishing: "The Jazz Musician's Guide to Creative Practicing" (2007), "The Jazz Singer's Guidebook" (2009) and "The Jazz Harmony Book" (2014).